It is necessary to lock your Android mobile device using password or pattern so as to protect your private data from threats of leaking or theft. However, what if you want to access the phone data but forget the password? The only way to resolve that is restoring the Android device to factory settings. But you don't want to do that because after factory resetting, all the data on the device will be wiped away. You surely wouldn't lose your precious files on the phone. Don't worry. Even though you lost all your personal data on the Android phone after factory reset, there are many data recvoery programs available for you to recover those missing files. 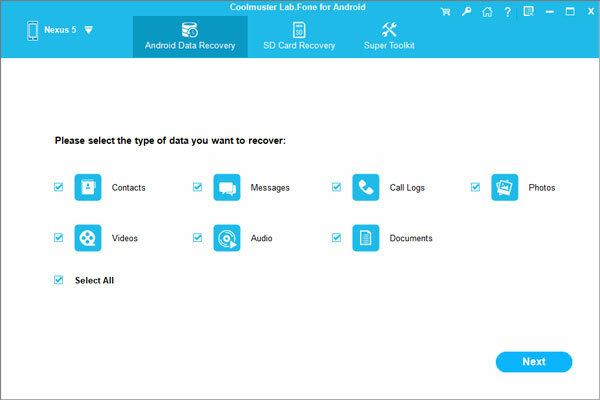 The best one is Coolmuster Android Data Recovery, which has been widely recognized as the most practical Android data recovery solution to help all Android users to recover photos, videos, music, apps, contacts, SMS messages, call history, etc. from Android mobile phones and tablets, such as Samsung, HTC, LG, Motorola, Sony, Google Nexus and so forth. Just have a try with the Android Data Recovery and I believe you will like it. The following buttons are the Windows and Mac versions of the program. Please choose the right version according to your computer. How to Recover Deleted Photos from Locked Android Phones/Tablets? Connect your Android phone to the computer with a USB wire and launch the downloaded and installed Android Data Recovery software on your computer. The software will automatically detect the connected phone. Choose the category of "Photos" and all pictures on your Android phone are scanned and displayed. Preview and select the ones you wish to recover by ticking them off. 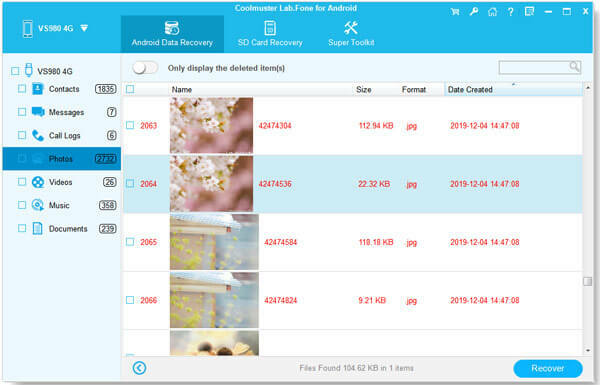 Click the "Recover" button that is on the right bottom part of the screen, select a destination folder to save the recovered Android photos, and the photos recovery process will begin instantly.